It’s been almost two weeks since Alicia and I arrived at Myaungmya. 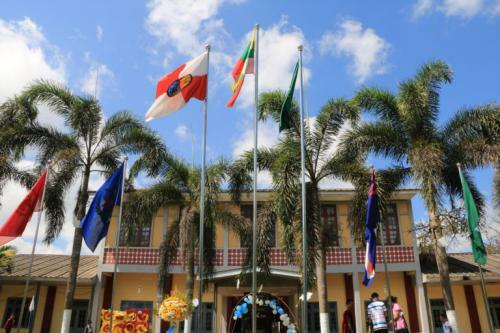 Besides the dusty roads, the people who seem to have plenty of time, the smog and honks, the dogs and mosquitoes, and the monks who sing their lullabies – which is all part of the everyday life in Myanmar – I stepped into the college life at MUAS. Let me share some of my experience with you. The campus is well organized and very clean. It’s a strong contrast to the surrounding area, like a little paradise. The students are busy with studies and work. From 6 a.m. to 6 p.m. there is just a little free time to take a shower and to eat. Nevertheless we found enough time to meet old and make new friends. After some time the students have begun to speak up, and our talk is much deeper than before. I learn to love them, and I can see there’s so much potential in each of them. “Ni kaung la?” (How are you?) – “Kaungdae” (Fine). These were the first Burmese words that I have learned over here during my three weeks of stay in Myaung Mya Myanmar. 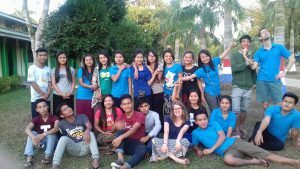 But I didn´t only get to know how to say “Good morning”, “How are you?” or “See you later” in Burmese, much more I could dive into the way people live over here, their culture and their way of sharing the gospel. I learned it from teachers and students at MUAS. If people asked me, how I experienced MUAS, I would tell them that it is a warm Campus through and through. I am not only referring to the quite high temperature they have during the whole year, but much more to the social climate and their hospitality. While our stay here the students were cooking for us many delicious dishes. Since I am not used to eat rice every meal I thought I might be done with it after one week. But they served so many different side dishes, that I never got bored of it. Everyday I got to know new people. Although I wasn´t good at memorizing their names, they helped me find the classrooms, translated the lessons, helped in organizing and supported us in every concern that we had. We even got bicycles for our ride to the hotel and a warm lemon juice in the morning for having a good start in the day. I experienced people who not only opened their doors for us but also their hearts. While eating together they shared their stories and we laughed, listened and prayed together. For me it was a valuable experience. During my stay here I also got the opportunity to visit and teach some classes. Business students as well as Education and Theology Students can chose from lots of different classes. The teachers aim to teach the best way they can. And sometimes you find not only students listening carefully but also lizards, birds and butterflies 😉 For more research on certain topics one can go to the library in the center of the Campus. Lots of students play Volleyball or soccer in the afternoon to balance studying and free time. For keeping the Campus clean everyone helps at the working afternoon. What I found most impressive, was, how the students prepare and live their worship. I have never seen people so engaged in practicing songs and preparing special numbers. One can hear that worshiping God through singing and playing instruments means a lot to the students. If night or day you will always find someone having a song on his/her lips. After two weeks of stay I can already tell that I will miss the people. As of late I got new brothers and sisters and it will be hard to be apart from them. They all have plans for their lives and their future. And from my heart I do wish them all the best for that and Gods richest blessings for they have been a big blessing for me.